Creator of BlenderGuru.com spent 6 months learning to draw and paint. Here’s the result. His journey explained here: 9 Artistic Lessons I Learned the Hard Way. What this goes to show is that anyone can learn to draw or paint. Though you might not be the next Leonardo Da Vinci but you’ll still be able to draw and have a unique style of your own. If you like art and have a passion for it, you can do it! 10 minutes worth watching. The only way to get better at your craft is to play the Long Game. Flipping through my files I came across these two by Kurt Papstein. My purpose isn’t to copy it exactly, but just to simplify them and imagine how I would go about Box modelling them. Sort of like retopologizing without actually doing it. Was flipping through my morgue file for creature references and did some form breakdown practice. (No tracing. Just quick blocking out (sketching) using a tablet and references as guide). This is a great way to prepare your mind for digital box modelling. While doing this I imagined myself box modelling but with a tablet. When creating 3D art, be it realistic or stylized, using reference is one of the most important parts of the process. It is as critical as modeling, unwrapping or texturing. Unfortunately, it’s an often overlooked aspect, especially by new or inexperienced artists. Since the creation of any art asset starts with building reference, you can go as far as saying that the final quality of the finished product is largely defined by the effort you put into reference in the beginning. Just imagine you’re building a house. You wouldn’t start building without a plan or any sort of idea where you are going. The building process itself may be more fun than planning, but in the end the house will not fit together well, look bad, or just collapse if you worked without a plan. The same goes for 3D art. Your work can end up looking fake, unfinished or just a little wonky, but you can’t put your finger on why that is. Simply sitting down and banging out a few gesture drawings every day is a great way to stay in drawing shape, but it will rarely propel you to a new level of artistic achievement. If your goal is to simply “get better,” your progress is likely to be slow and demoralizing. Currently taking things slow and trying to learn proper proportions. The ability to handle the pencil and a good control of your arm (mechanical skill) is one thing (something I already have), knowledge and a way of breaking things down is another (something I need to work on). Drawing isn’t a single skill, but many other skills combined such as the way you handle the pencil, the way you see, simplify things and so on. Do you need to be a great traditional artist to be a good modeller? Not necessary. There are plenty of skilled digital artists out there that don’t have great drawing skill, but they do know anatomy, basic proportions and so on! What goes on in your mind is really the key here. Traditional or Digital are just mediums for these knowledge and mindsets to come alive and both, whether traditional or digital, requires a lot of practice! The simpler you see things, the easier your life as a modeller will be. The reason why I am seeking to improve my 2d skill is for teaching purposes and personal notes taking, and hopefully make model sheets for those that are just starting out in the world of digital modelling. I was experimenting with the Skin Modifier and in my opinion it’s not perfect. For some things it can be quick and fast, but if precision and good looking forms is what you’re after then you will have to play around a bit until it looks right. Which can be a bit time consuming since you don’t have total control over areas that bend, like the armpit for example or the neck is too short. To fix the arm, I had to change it to a different pose (T-Pose). I guess the whole point of using something like a Skin Modifier is to get the rough shape or form so that you can get right into sculpting, which is great for creatures modelling/sculpting (not saying that you can’t do that for characters). For me personally, I still prefer the old Box method. Maybe what you can try is combine both methods? Box and Skin Modifier. I find the Skin Modifier makes it a lot easier to block out the arm and hand. Perhaps you can do that and attach it to your Box form? Suppose the thought enters your mind that you want to build a house. You sit down and make a list of all the materials you think you will need. Then you order them to be delivered to the lot where you will build. Everything is piled in the center of the lot, and the next day the bulldozer comes to excavate the basement and everything is in the way. It’s all just where he has to dig. Why? A failure to plan. Brush Demonstration (BD for short from now on) is a short series that I’ll be putting together to show how each brush in Blender’s sculpting mode is used. I am basically learning and discovering them as I go, and today it’s the Inflate/Deflate brush. 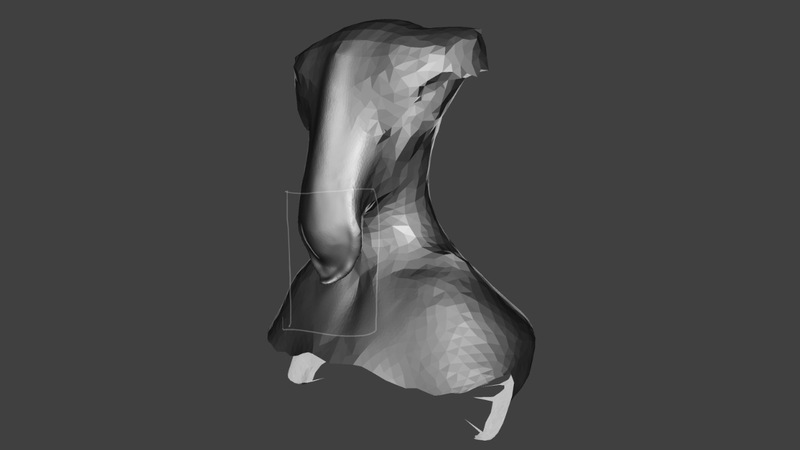 Earlier I was trying to give more definitions to my Thumbnailling experiments last night, and for this particular head I noticed that it was difficult to add form and volume to this flat piece of mesh/polys. Blob and Clay brushes won’t do it! With patience, you can actually get the look that you’re after, but why when the Inflate/Deflate brush can do it much quicker? When using this brush I imagine that I’m blowing air into a flat balloon. Very useful when you’re trying to solve cylindrical shapes/forms such as the arm, leg etc… if they’re too flat or thin then simply Inflate them! Too fat? Deflate it.